We bring the dance studio to your child! All registration and payments are now managed through a dance account you create during the registration process online. You will be able to check your balance, make payments, update your account. Allow our teachers to do what they do best, teach your child, instead of collecting and recording payments and leaving reminders each month. 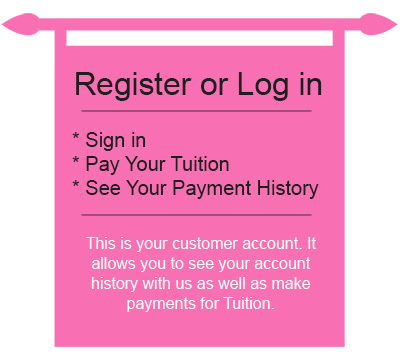 Tuition is due the first lesson of each month. Tuition charge is the same amount each month. Although some months may have three or five lessons, over the course of the term there is a four-lesson average. Checks and cash payments are no longer accepted at the dance locations. If you do not have a credit or debit card, please call Cyndi at 340-7908 for other available payment options and add a note when registering to request a payment booklet. All payments must be mailed directly to the Dance Connection, not left at the school. You may also pay several months or for the year in one check. In split-custody situations, the parent or guardian who enrolls the child is responsible for making the tuition payments. IF PAYMENT IS NOT RECEIVED BY MONTH’S END, THE STUDENT WILL NOT BE PERMITTED IN CLASS THE FOLLOWING MONTH. OUR POLICY IS TO NOTIFY PARENTS BY PHONE BEFORE A CHILD IS WITHHELD FROM CLASS. We have been lenient in the past with students who have not paid their tuition on time and have allowed a generous grace period. This year we must stick to the tuition guidelines. We do not like having to withhold children from class. It is very embarrassing and uncomfortable for the child as well as the teachers. If you are having financial difficulties, please let Cyndi know; she will be happy to work with you. EMAIL: We will communicate primarily through email. Monthly emailed newsletters provide all of the information you need regarding classes, recitals, costumes, performances, holiday schedules, etc. We will not share your email address with anyone or bombard you with unnecessary emails. Refunds or credits are not issued for lessons missed unless prior written notice has been given and at least three lessons will be missed. Dance clothing and shoes are not required, but for many girls, dressing for class is part of the fun. Dancewear for class can be any color or style. For your convenience, dancewear can be purchased on our website or at most of the major department stores. Please label all dance attire. Students may also wear any comfortable clothing that allows them to move freely, such as sweatpants or shorts. Please observe quietly without disturbing the class. We request occasional, rather than weekly visits and encourage observations the last class of the month. (The first lesson of the month we are usually learning new things and the children are more confident in the new material toward the end of the month.) Thanks for your understanding in this matter. As Dance is a performing art and most parents do not have the opportunity to come and watch class very often, we will hold a recital on a formal stage at one of the local high schools to showcase the skills the students have learned. Location, date, time, and costume information will be distributed in January. Participation is optional and there is a costume fee involved, usually around $45.00 (includes hair accessory and tights).